Oral hygiene is important for the health of your teeth, gums, and dentures. Dentures require some basic care in order to stay clean, but with a simple daily routine you’ll find that proper denture care only takes a few minutes extra per day. One of the biggest benefits of the removable denture is the ability to keep it nice and clean with some preventative maintenance. After eating food or drinking a “heavy drink” (such as a milkshake or caesar), remove your dentures and rinse them in the sink. Bonus Tip: place a soft towel on the counter and underneath where you are holding your dentures. This will help prevent your dentures from breaking if you accidentally drop them. This one seems like a no-brainer, but it’s important that we bring it up from time to time! Just like natural teeth, the teeth on your dentures will build up plaque and tartar. Brushing them daily, ideally after they’ve been soaking overnight, goes a long way in keeping your dentures (and mouth) clean. Toothpaste, many household cleaners, and abrasive cloths/wipes can all damage your dentures. When cleaning your dentures, ensure that you are using a non-abrasive cleaner. Gentle hand and dish soaps can be used to clean your dentures, as can dedicated denture cleaners. Bonus Tip: to soften your toothbrush up a bit before brushing, rinse the toothbrush under hot water for a minute or two to soften the bristles. Be mindful when brushing immediately after rinsing, as the brush may still be hot. Plaque, tartar, bacteria, and other microbes grow on dentures just as they do natural teeth. 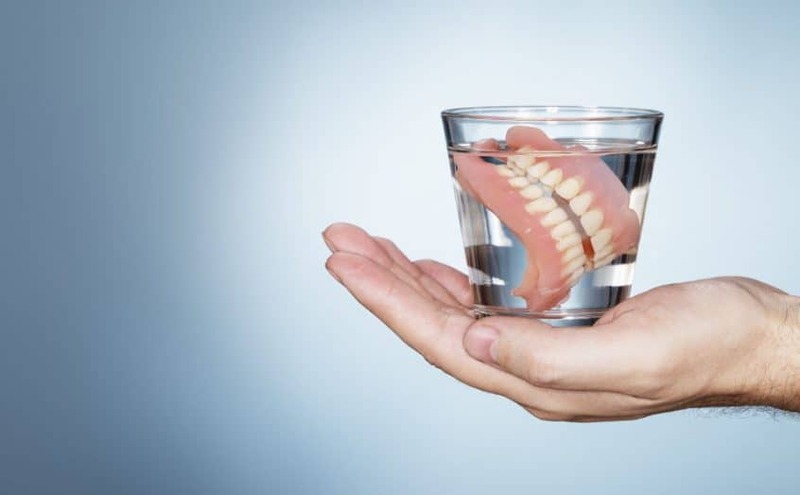 Soaking them overnight (either in a dedicated denture solution, warm water, or a water/vinegar solution) helps displace plaque, tartar, and microbes. In addition to the benefits soaking provides for cleanliness, it also helps dentures maintain their shape. Bonus Tip: if your dentures are metal, only use a warm water solution. Ensure the water is warm and not hot, as hot/boiling water may damage your dentures. Our door-to-door courtesy shuttle is available for your convenience. Can Dentures Cause Bone Loss? First opening our doors in 1992, Chinook Denture Clinic are experts in partial dentures, denture retrofits, and complete denture solutions. Visit one of our two locations in NW and SW Calgary. Don't forget about our free door-to-door courtesy shuttle! Free courtesy shuttle available for patients at the Northmount clinic.